“You need to blog about this place and I want to come with you when you do.” That was Text #1, from my friend Mario. Text #2, also from Mario, moments later. Text #3 came from my sister Kelly, who was with Mario and considers it pure serendipity when she hears “Back in the High Life” by Steve Winwood while drinking Miller High Life. Now in the ideal world, when I was so clearly needed at a bar, I’d be able to drop whatever I was doing, grab my camera and notebook, and head over posthaste. Sadly, the ideal world has not yet revealed itself to me. Until it does, let me tell you about the Corner Tavern, the establishment from which Mario and Kelly were so enthusiastically texting. Needless to say, I had to see what all the fuss was about. I’d never even heard of the Corner Tavern, but by the way they were carrying on, I figured it must be a gleaming, two-story palace with the bartenders greeting you like an old friend as you walked in, giving you a free round of drinks, and handing you a gourmet menu where everything’s always half off. So I was surprised when, just a week after all the frantic texts, Mario led me to a small, unassuming, downstairs bar in the Back Bay. With a nondescript concrete exterior, in the basement level of what I think is an apartment building, the place practically blends right into its surroundings. I took one look and figured “standard dive bar, probably three beers on draft (two of which will be Bud Light and Stella), a typical menu of burgers and wings, indifferent staff. And since the Sox were in town and the Celtics were in a Game 7 showdown against the Philadelphia 76ers, I assumed the bar would be jam-packed and we’d be standing all night. I wasn’t apprehensive, but I wondered why Mario and Kelly were so adamant that I come here. Maybe they were just hammered at the time. I was wrong about pretty much all of that. For starters, the bar was surprisingly quiet for a Saturday night; maybe 8 to 10 people. Mario and I got there around 7, which is a little early, but such high-stakes sports nights in the city usually result in the masses all trying to cram into their favorite tavern. Not that either of us were complaining about not having to jockey for space. And even if it had been packed, this cozy place is actually fairly spacious. 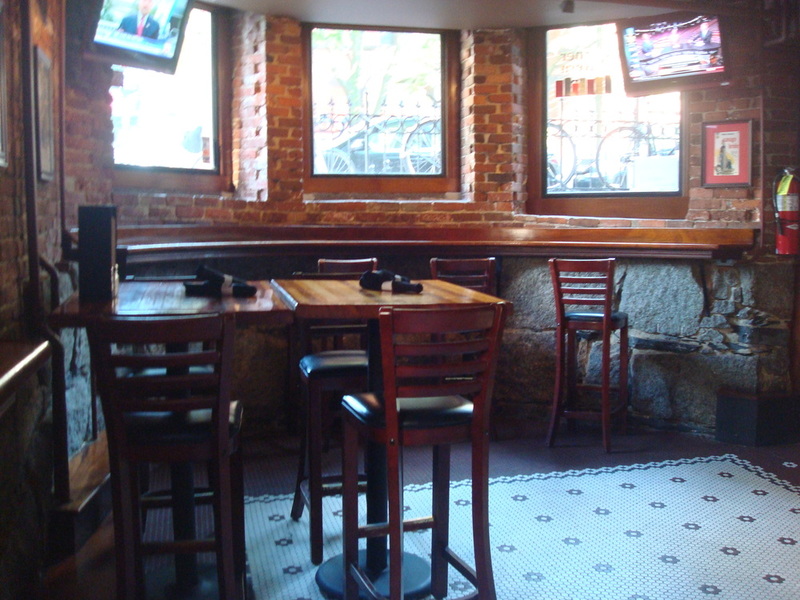 The surrounding exposed brick and stonework on the walls give it something of a cave-like feel, but it’s far from gloomy; large windows in the front of the bar offer a view of the classic Boston brownstones, and before night falls, they let in plenty of sunlight. A cherry and white color scheme rounds out the warm feel, and the mirrors behind the bar and on the walls maximize the depth. There are about 10 to 12 seats at the bar, a few tables in the vicinity, and a rounded seating area looking out onto Marlborough street. There’s a long shelf on the wall opposite the bar with a few stools and plenty of standing room, and a small dining area in the back, illuminated by cool hanging red lights. 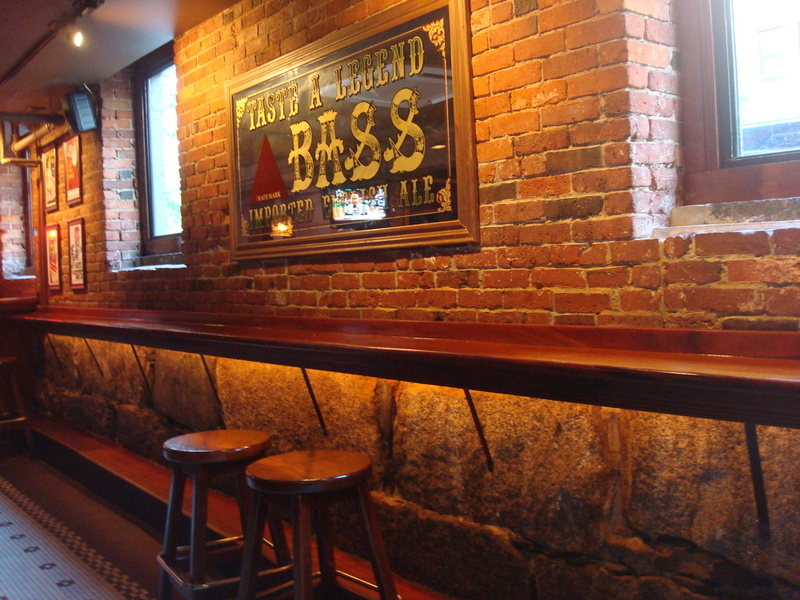 The Corner Tavern has five beers on draft, a couple of which rotate, and the selections were a pleasant surprise – Harpoon IPA, Guinness, Allagash White, Lost Abbey, and Penn Pilsner. They also have a decent bottled beer menu, along with PBR tallboys if that’s more your speed. One look at the food menu, and any preconceived notions I still had about a tucked-away downstairs bar went out the window. The appetizer list really dresses up the typical pub fare, with choices such as slow-roasted chicken wings, pulled pork sliders, and a couple varieties of hummus. 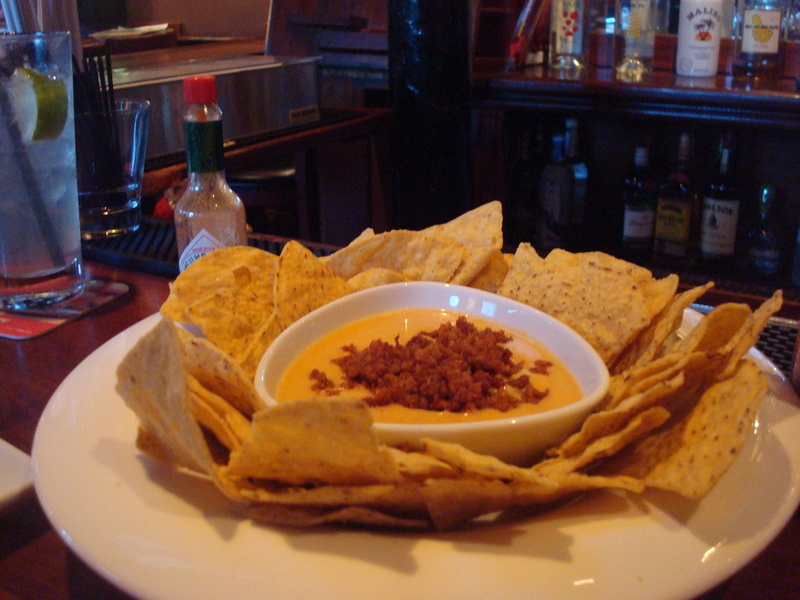 Mario and I went with the homemade queso dip with chorizo and lots of Sriracha sauce, and we devoured it handily. While watching the Sox and waiting for the Celtics game to start, I headed over to the jukebox to inject a little life into the otherwise quiet environment. As I scrolled through my options, the bartender politely let me know that, once the Celtics got going, he’d have to turn on the audio, so I should be careful about how many songs I picked. 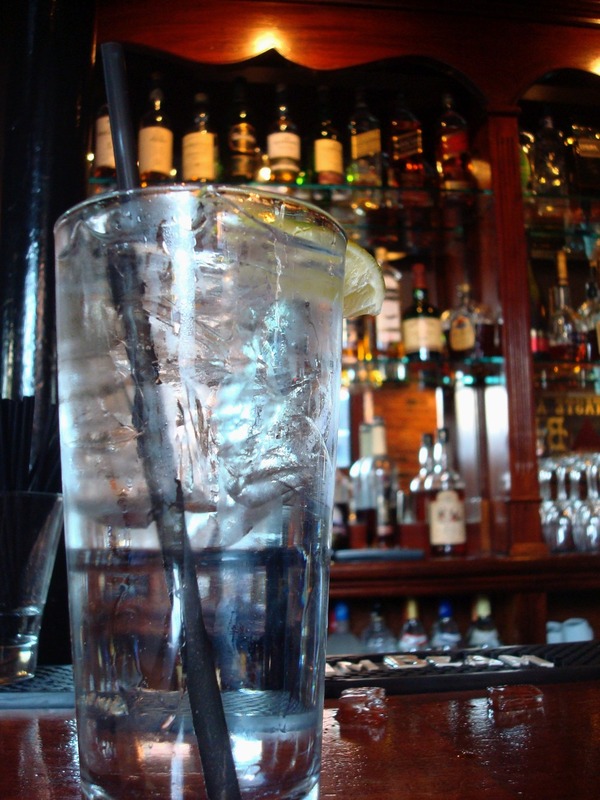 You know, it’s one thing to be waited on by a friendly bartender; it’s another to feel like the bartender’s looking out for you, in some small way. When the Celtics game got under way around 8 p.m., there were about 12 to 15 people in the bar and the dining area was full. Before things got into full swing, the bartender came by and, believe it or not, asked me if I’d heard all my jukebox selections before he put the sound on. That’s a first. As my awesome musical selections faded out and the Celtics got rolling, we moved on to the dinner menu. Again, the Corner Tavern goes above and beyond with their dinner options. 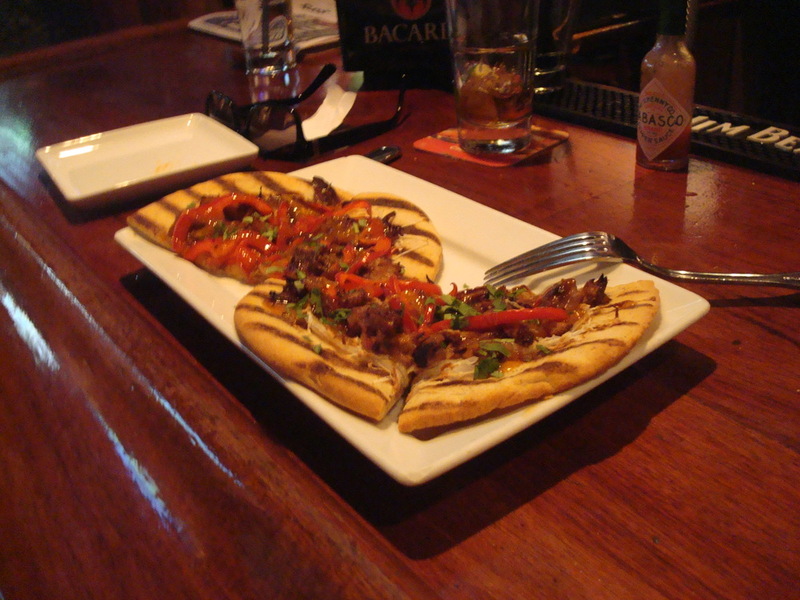 They offer a creative variety of flatbread pizzas, and Mario went with that evening’s pizza special, which was topped with braised pork and shaved jacima. The sandwiches are just as impressive. Mixed in with pub standards like a buffalo chicken wrap and a pastrami reuben are intriguing options such as a shortrib sandwich with goat cheese and a crab cake BLT with a spicy remoulade sauce and bacon. I got the meatloaf burger, which was essentially a meatloaf sandwich in the shape of a burger, topped with chipotle ketchup, cheddar cheese, and applewood bacon. By 10 p.m., as the Celtics were closing in on their victory, there were about 20 people, nicely spread out and not making the bar feel too crowded. There were a couple of diehard fans there, cheering along and shouting dutifully at the TV, but for the most part, it struck me as a good spot to watch a game when you’re looking for a quieter atmosphere. I stopped in again around 6 p.m. this past Thursday to see what the after-work crowd was like. Things were fairly lively but not terribly crowded – about 15 customers when I got there. The Sox were playing at home, but still, the bar didn’t draw a lot of pre-game revelers. There were a couple of new draft beer options – a delicious Summer Solstice Cream Ale, which was creamy (imagine that) and had hints of vanilla, and 21st Amendment Bitter American. And if this place hadn’t already won me over, I saw that they had Abita, one of my favorites, in bottles. When I was there, I noticed a couple of well-worn newspapers on the bar, and it made me think, this is a neighborhood bar if ever there was one. It would be the perfect place to stop in on an afternoon, read the paper, and drink a few pints of craft beer. And maybe even text a friend to join you. 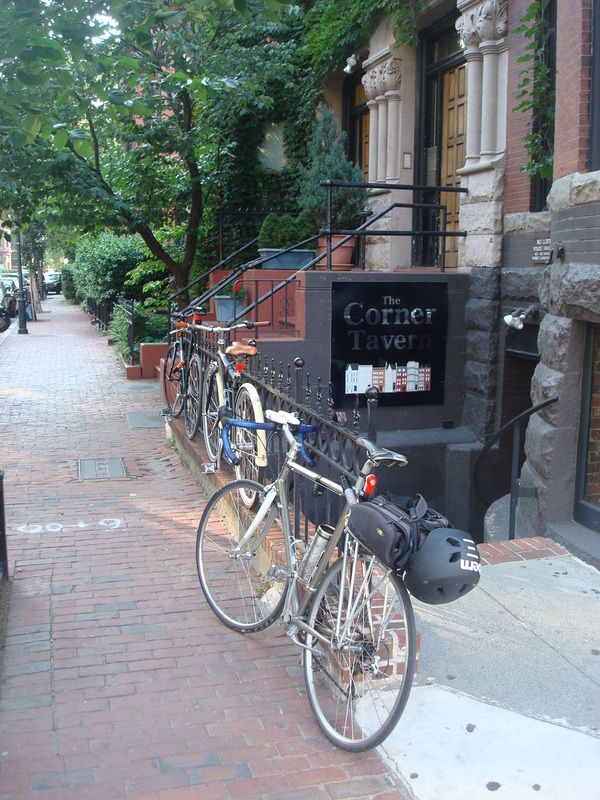 Located on the corner of Mass Ave and Marlborough Street (hence the name), the Corner Tavern is one of those places you might not even see unless you’re looking for it. But if I lived in the area, I’d totally be a regular. 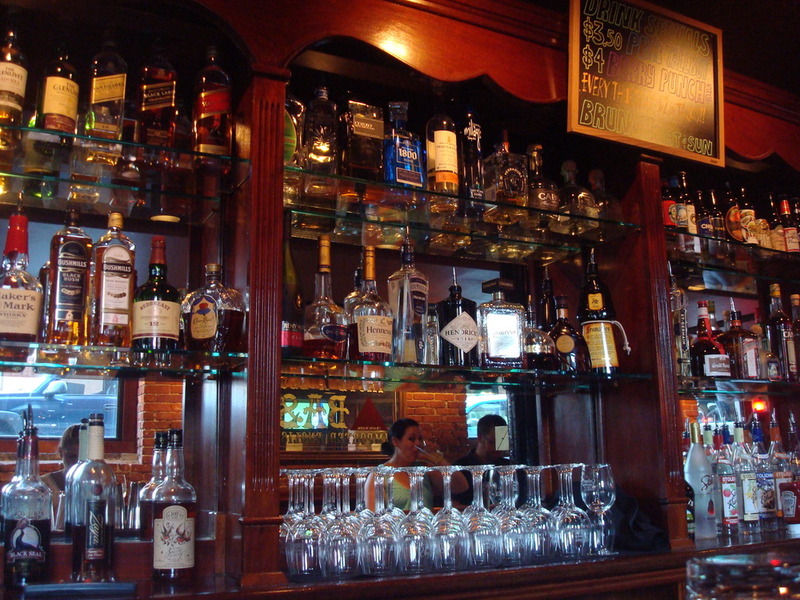 The beer selection and the food menu are enough to satisfy most tastes. The prices are pretty fair – mixed drinks are about $7 or $8, craft beers $5.50 or so; and if you’re on a budget, a $3.50 PBR is reasonable. 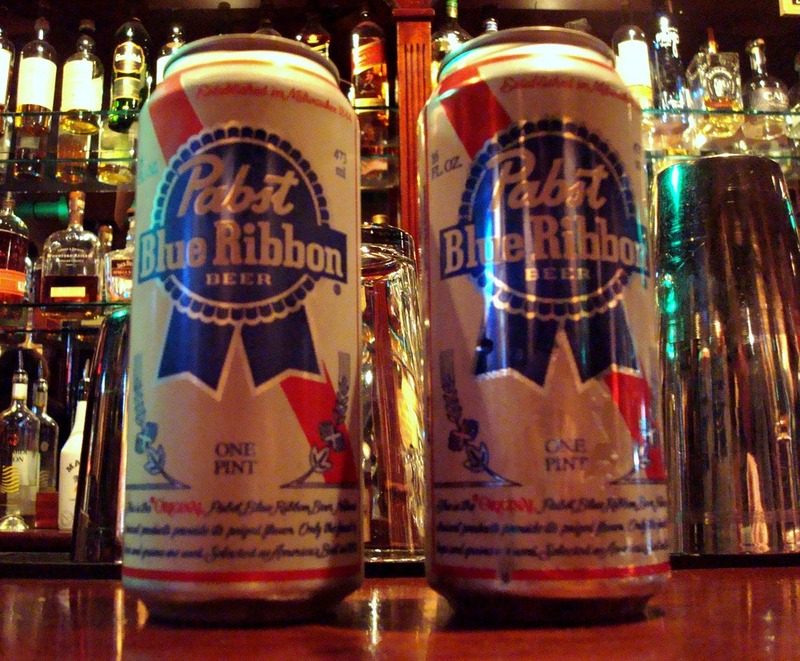 Pair those PBRs with the $2 tacos that are offered on Thursdays, and you’re in business. Most flatbreads are $8 or $9, and my excellent meatloaf burger was $10. I’m especially fond of the location. If you’re looking for a laid-back place to grab a quality bite before a Red Sox game, this place is a hidden gem. It’s about a 10-minute walk from Kenmore, which puts it outside the radius of bars that draw huge pre-game crowds, but not far enough to warrant a ride on the T. It doesn’t have enormous flat-screen TVs, but the seven or eight small TVs they do have are more than ample if you’re looking to watch a game. As an added bonus, there are outlets beneath the bar if you need to charge your phone or plug in your iPad.